In waste minimization, the objective is to make a process more efficient in its use of raw materials. This objective is achieved through improvements in the reaction and separation systems within the process. Because these systems often require the addition or removal of heat, a design engineer can use pinch technology to identify the cost-effective process modifications. The following example from a fine chemical plant illustrates this use (Rossiter, Rutkowski, and McMullen 1991). Figure 3.11.8 shows the process, which is a batch operation. The stirred-tank reactor is filled with two feeds (F1 and F2) and is heated to the reaction temperature with the steam in the reactor jacket. The temperature is then maintained at this level to allow the reaction to proceed to the required extent, after which the vessel is cooled by water passing through the reactor jacket. This cooling causes the product to crystallize out of the solution. The solid product is then separated from the liquid by filtration, and the filtrate is rejected as an effluent. (b) Modified process allowing a steeper flue gas line which reduces fuel and emissions even though the process duty has not changed. FIG. 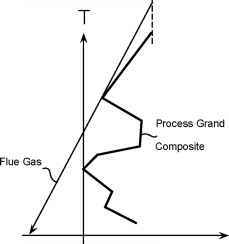 3.11.7 Grand composite curve allowing the minimum flue gas to be drawn leading to reduced flue gas emissions. 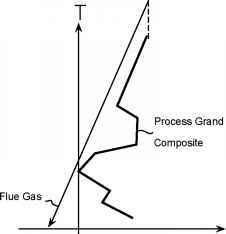 (a) Flue gas matched against the process limited by the process above the pinch. (b) Modified process allowing a steeper flue gas line which reduces fuel and emissions even though the process duty has not changed. 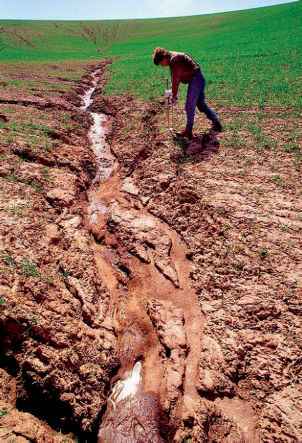 lighted an opportunity to totally eliminate the effluent without increasing the energy costs. Steam to the original process shown in part a of Figure 3.11.8 was supplied at 10 bars. However, the grand composite curve for the process (see Figure 3.11.9), which plots the net heat flow against the actual, required processing temperatures rather than the existing practice, clearly shows that steam at only 2 bars is hot enough for the reactor requirements.